MTB stands for mountain-bike. 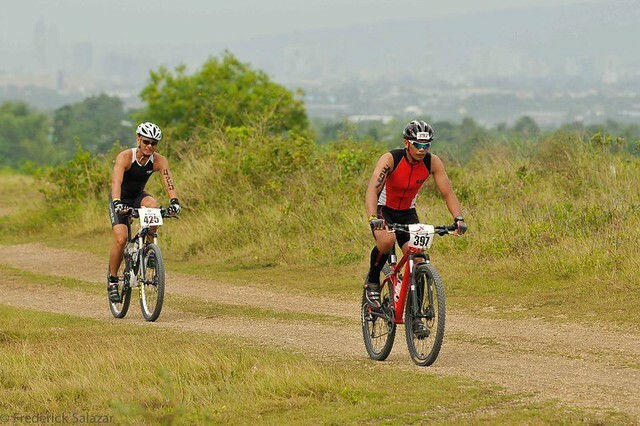 It’s that vehicle on two rugged tires with a flat handlebar that we used to maneuver the treacherous landscape of Liloan during the XTERRA last Sunday. 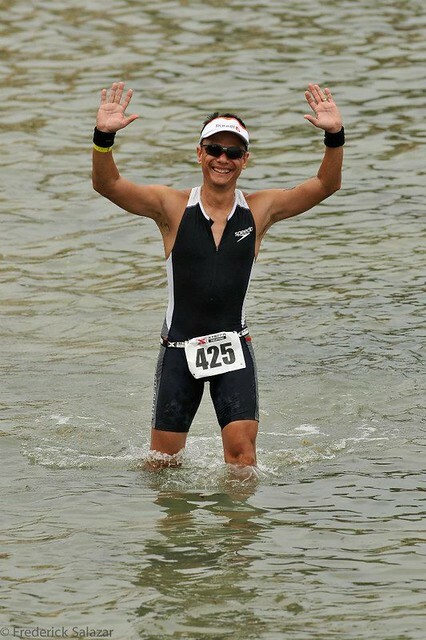 After my “waterloo” (the water, open-sea swim) was done, it was off to the 35-km. MTB ride. I loved it. You’re outdoors. You climb rocks and descend on slippery sand. You pedal amidst thick grass and brake once a giant boulder glares at you. After my 14:39 swim time, my bike ride was 2 hours, 44 minutes. Not fast; conservative. Early on my first of two loops, my three CO2 bottles fell. Had I gotten a flat tire… Oh, no. Thank, God, that didn’t happen. The one occurrence that I also avoided did not transpire: meeting an accident. With such a technical and scary bike route—the architect of whom was Architect Miguel Flores—not getting battered or wounded was the goal. Another “Thank you, Lord” moment, I only fell once with a minor hip bruise. Porter Marina? Beautiful. We entered the enclave surrounded by yachts and pedaled to the tip where we circled the gazebo. The Gatorade station awaited us. Guess who I saw there? A Cebuano whom I admire the most, Dr. Wyben Briones. He helped with his team from the All-terrain Medical Relief Org (AMRO). The cheerers? I’ve joined numerous marathons and I’ve never witnessed as many loud voices—especially children—than four mornings ago. Because you bike on narrow paths, the residents troop out to watch and cheer. In the schools that we passed, the elementary girls and boys shouted, “YOU CAN DO IT!” Well-orchestrated by Mayor Duke, the Liloan residents provided extra boost to fuel our tired legs. Not only were the spectators nice but the pros were, too. Before Ben Allen zoomed past me, he signaled, “Will pass through the right!” As he—and the other pros—would zip through, they never failed to say, “Thank you” after the pass. Amazing. This is the beauty of this sport. You not only get to compete right beside the world’s elite—but they’re courteous and respectful. RUN. Since I joined the Lite, my run was 5K. After three hours of swimming and biking, the body gets weary. Still, not to have drowned nor gotten injured (yes! ), the run was extra fun. I clocked 38 minutes. We zigzagged through off-road ground and hopped towards the beach. 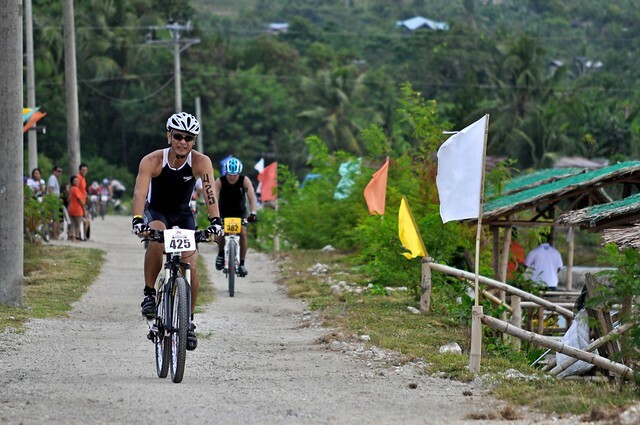 We ran beside the Liloan shoreline and, upon reaching the tip, had to wade through knee-deep waters for over 100 meters. I thought this was a swim-bike-run triathlon… Are they adding a swim as the 4th and final obstacle? Ha-ha. After 3 hours and 36 minutes, with Jasmin, Jana and my mom Allen waiting at the finish, I crossed that line with arms raised high. Yes! BEN ALLEN STORY. Two days before race day, Ralph Sios-e and I visited Amara for a practice swim. As we finished changing and were about to leave, a man approached us. Can I hitch a ride? he asked. He was alone and had no vehicle ride back to the city. Sure, we said. We didn’t know him but he needed help. But just as we were packing our things, Jacs Jacalan drove by. 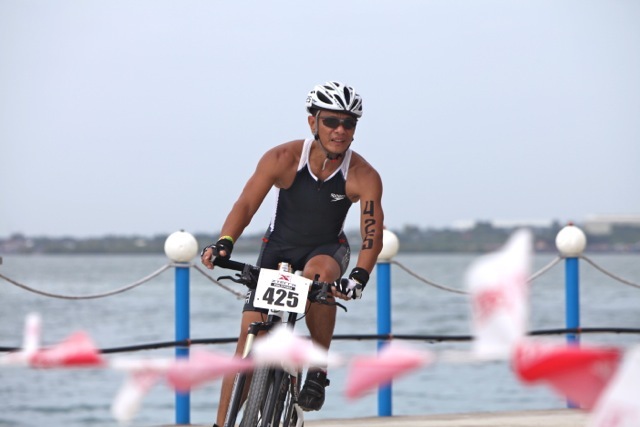 He, Tenggoy Colmenares and Jomer Lim were ready to go… and so he rode with them instead. At the Carbo-loading Party the night after, Jacs tells me: remember that guy who rode with us? His name is Ben Allen. 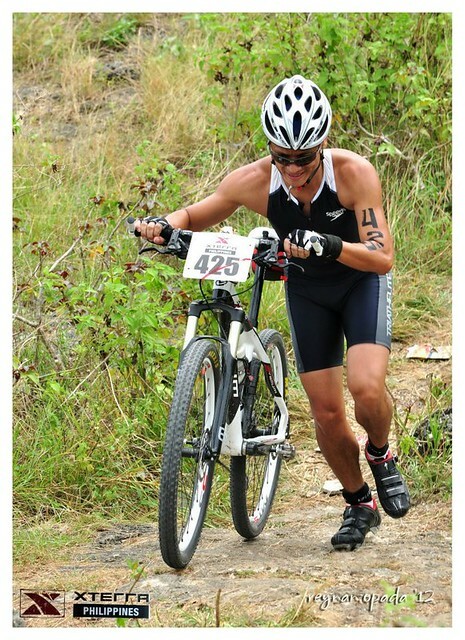 He was Xterra champion in Guam the week before. Simple, ordinary-looking fellow but he beat all the top-rated elite pros. We saw Ben later that night at CICC and, like he was when we first met him, he was relaxed and had none of that “celebrity air” found in others. It turns out, Ben was a P.E. teacher in Australia and had no sponsors. He joined and needed to win to earn enough money to compete! The next morning, Ben Allen obliterated the field—winning in 2:30. His is an example of this adage: Nice guys finish first. This is a very interesting article! One of my college classmates joined the event and I can see from his FB page that here really enjoyed it. I’ve a sports enthusiast my whole life but haven’t really got into all three in one event! Fantastic! You’re blog is very inspiring. I mean, not all of us are natural-born athletes!…but we can definitely develop the skills to be one. I especially like the part when you mentioned in one of your blogs that we start w/ 5k…and after that aim higher! Sooo true! I just had my second 5k and now I’m training for my 10k 🙂 Job well done. Keep inspiring others.